Get to know us at myPharmacyonline.ca! MyPharmacyonline.ca is based out of North Saanich, British Columbia on Vancouver Island. 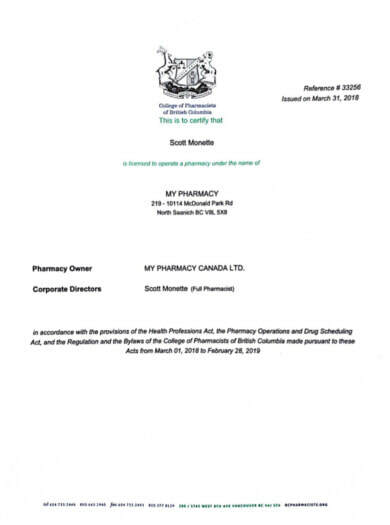 We are a private, pharmacist-owned corporation proud of sound business principles and low overhead, allowing us to bring the lowest-cost prescription products to our Canadian customers. All of our pharmacists are trained in Canada and hold licenses to practice pharmacy in Canada. Our mission is to provide the Canadian public with the most cost-effective prescriptions while investing back into the health of our customers and our greater community. *Our license is renewed annually, our most recent license is displayed on location at our dispensary. You can check our status with the College of Pharmacists of BC by calling 604.733.2440.